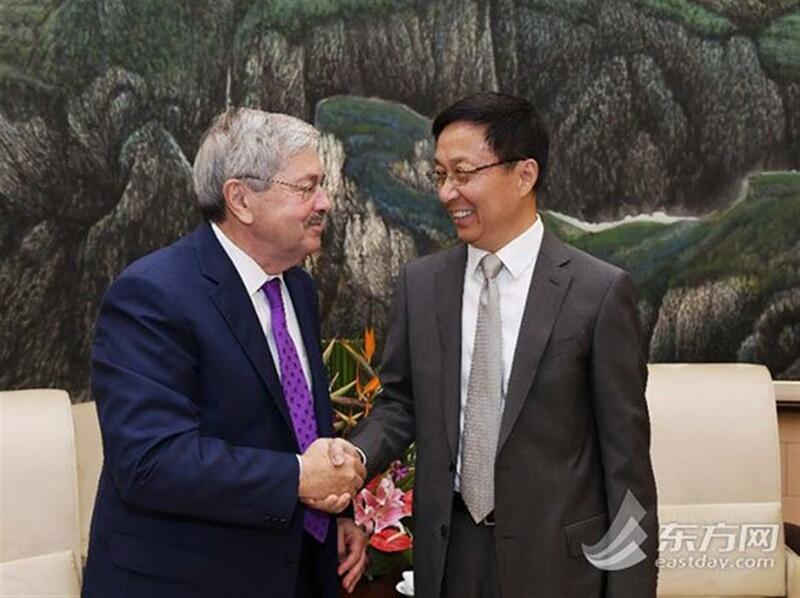 Shanghai Party Secretary Han Zheng met the United States Ambassador to China, Terry Branstad, and his delegation on Wednesday. Han welcomed the ambassador on behalf of the Shanghai Municipal government, saying China and America have close economic relations. He said Shanghai has collaboration in trade, education, and cultural industries with its American twin cities San Francisco, Chicago, and Houston. He said many American companies have participated in and witnessed Shanghai’s development, reforms and opening up over the years. Many are members of his advisory council and have made valuable suggestions about Shanghai’s development. Han expressed hope that both countries’ governments could have more friendly exchanges to deepen Sino-US relations and collaboration. Branstad said Shanghai is a beautiful city with a successful economy and a model of reform and innovation. It has provided opportunities for many American companies. He hoped more Chinese businesses could feel as at home in America as their American counterparts do in China, and more exchanges can strengthen the Sino-US relationship and collaborations.